Global-Pills-Market.Net is an online drugstore than never managed to hold its position on the web for long. The drugstore had started operating back in 2015. In a span of fewer than 3 years, the pharmacy is already gone. The drugstore never indicated where it was located. The store focused on selling medications which have been approved by the FDA. Global Pills Market had a small catalog. The store was trying to help men who suffer from erectile dysfunction solve their issues. All the meds available on the drugstore were aimed at treating impotence. The pharmacy was actually one of the cheapest drugstores. The generic Viagra on its catalog was worth 0.36 dollars while Cialis was being sold at a price of only 0.88 dollars. Generic Levitra was being sold at a price of 1.48 dollars. Most of the generic ED pills available on Global-Pills-Market.Net had their source in Indian pharmaceutical companies. The store was also stocking brand pills. Brand Viagra was being sold at a price of only 2.45 dollars per pill. Brand Levitra was worth 2.80 dollars. The store did not stock brand Cialis. The Pharmacy required their customers to pay for their meds using credit cards, E-Check, and Bitcoin. The credit cards accepted by the drugstore included VISA, American Express, and Mastercard. After paying for medications, buyers were supposed to expect them to arrive via either Airmail international or Express Mail Service shipping methods. The first delivery method took approximately 14 to 21 days before the medications got delivered. The second method which was trackable took approximately 5 to 9 days. If the delivered products were damaged, the buyer was required to contact the customer support department. The pharmacy was offering free re-shipments or full refunds for damaged products or items which never reached the buyer. Products were being delivered in concealed packages. This means that nothing was available on the package which indicated the contents available inside the package. Buyers were allowed to contact Global-Pills-Market.Net either via their live chat option or their contact page. The pharmacy was offering its services worldwide. This was even implied on its website by the presence of various currencies. These included the USD, GBP, EUR, AUD, CAD, and, the CHF. The pharmacy had a language changing feature. The languages available on the drugstore website included English, Italian, and others. Locating medications on the drugstore was easy. Buyers could have used the search function or the alphabetical search function. Jerome from Virginia reported that when his father got sick, he searched all over the web to locate a place where he could have purchased high-quality medications at a great price. He managed to locate Global-Pills-Market.Net. He had been ordering medications for his father from Global Pills Market ever since. He was about to place his 6th order. It was his 4th month as a Global Pills Market customer. Brian from Belfast is very careful when using his credit card. He needs to be sure that everything will be kept confidential. He only uses the companies he knows he can trust. His friends checked Global Pills Market numerous times. He, therefore, tried to try it. He did not end up regretting his decision. The prices were nice and the delivery was quick. Santiago from Cordoba reported that after using Global Pills Market, he realized that it was exactly what he needed. He had been ordering his meds from Global-Pills-Market.Net for three years. He was satisfied and he was not going to change anything. The above reviews cannot be trusted. They could have been crafted by the Global-Pills-Market.Net management to try and attract more customers. I have come across pharmacies which look very real, have nice looking websites and some very positive customer testimonials on their sites. After doing some deeper digging, I determined that the pharmacies were fake. The best reviews to trust should be on a third-party website. The program I used is known as Scamner.com. 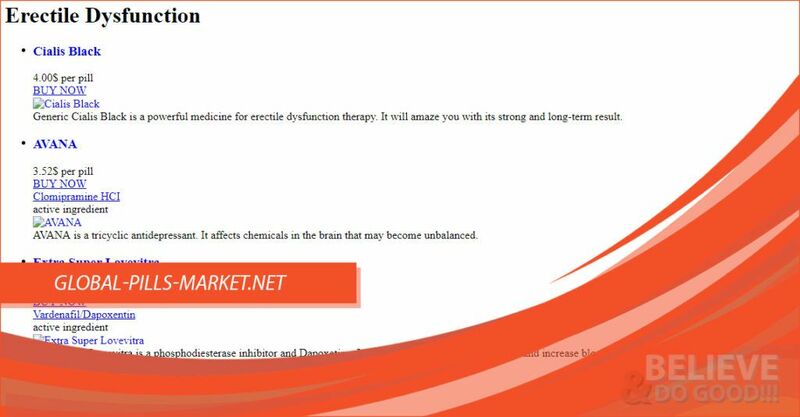 The program indicated that Global-Pills-Market.Net is not a safe website. The site is not recommendable for both browsing and purchasing of meds. The store did not have many visitors. Famous online pharmacies usually have a large number of visitors who purchase meds from the pharmacy every now and then. My search for coupon codes which could be used at Global Pills Market succeeded at finding nothing. The pharmacy did not have any offers on its website. This was quite new to me. When a popular pharmacy lacks coupon codes, the drugstore has a very high likelihood of having great offers on its official website. However, Global Pills Market had nothing like the free pills which I am used to locating on other online pharmacies websites. The only way buyers could have saved their money when purchasing meds from the pharmacy was through purchasing the meds in bulk. The store had decreasing prices as the number of purchased pills increased. Global Pills Market was an online drugstore that did not have a lot of trust from buyers. The pharmacy had low prices yet nobody wrote even a single testimonial on an external review-collecting website. The reviews available on the drugstore website appeared fake. The store did not indicate where it was located. Popular pharmacies never hide their physical location.